1. JOHN GEORGE¹ PAGET, was born in Yorkshire, England about 1796 (he was 45 on the 1841 census). John probably died before the 1851 Wortley Census as he is not listed with the family. He married, JOHANAH WILSHIRE in Leeds, Yorkshire, England, on 22 Aug 1818. The “Johanah” spelling is taken from her signature on her marriage certificate. John George and Johanna Paget were living on the “Chapeltown Road” during the 1841 Census. Note that Georgiana is not in the census…is she away from home as a 14 year old servant in another household?? The 1851 finds the Paget family: Joanna, John George, Frederic, and Georgiana. Missing is John George Paget Sr. and Hannah. Elizabeth (Axellson) Paget was born in Hull. Above we see mother Joanna Paget age 60, born 1791, in Somerset; her oldest son John George Paget age 30, born 1821, in Leeds with his wife Elizabeth (Axellson) Paget born in Hull about 1824; then Frederic Paget age 26, born about 1825 in Leeds (could Ann be his wife? ); then Georgiana age 24, born about 1827 in Leeds. Hannah at age 22 must be married and in another household? i. GEORGIANA³ PAGET, born in Leeds, Yorkshire, England in 1853.
i. JOHN³ PAGET, born in Leeds 1857; died 1902.
ii. FREDERICK WILLIAM³ PAGET, b. in Leeds, England, 15 Jul 1858. 3. FREDERICK WILLIAM³ PAGET, (John George², John George¹), was born in Leeds, Yorkshire, ENGLAND, 15 Jul 1858; he died in Hazel Hill, Guysborough, Nova Scotia, Canada 9 May 1910. He married ELIZA MAUDE WHITE in Guysborough County, Canada, 1 Dec 1885. Leeds in 1866, when Frederick William Paget would have been living there at 8 years old. The Commercial Cable Company where Frederick William Paget worked in Hazel Hill, Nova Scotia. “The death of F. W. Paget took place at his residence, Hazel Hill, on the 10th instant, after a lingering illness. Indifferent health for some years past compelled him a year ago to resign his position with the Commercial Cable Co., of whose staff he was one of the original members, coming to the “Hill” from Tor Bay, where he was with the Direct U. S. Cable Co. after coming to this country. i. ALFRED GEORGE4 PAGET, born in Canso, Nova Scotia, Canada, 18 Oct 1887. 4. ALFRED GEORGE4 PAGET, (Frederick William³, John George², John George¹), was born in Canso, Guysborough, Nova Scotia, Canada, on 18 Oct 1887. He was baptized in Canso on 9 Sep 1888 by Edward Ansell, Incumbent, of St. John’s Parish located in Arichat, Cape Breton, Nova Scotia. He died in San Francisco, San Francisco, California, USA, on 5 Sept 1927 of colon cancer. He married NELLIE OLIVE BOOTHBY in Agana, Guam, Mariana Islands, on 17 Jan 1922. The Rev. 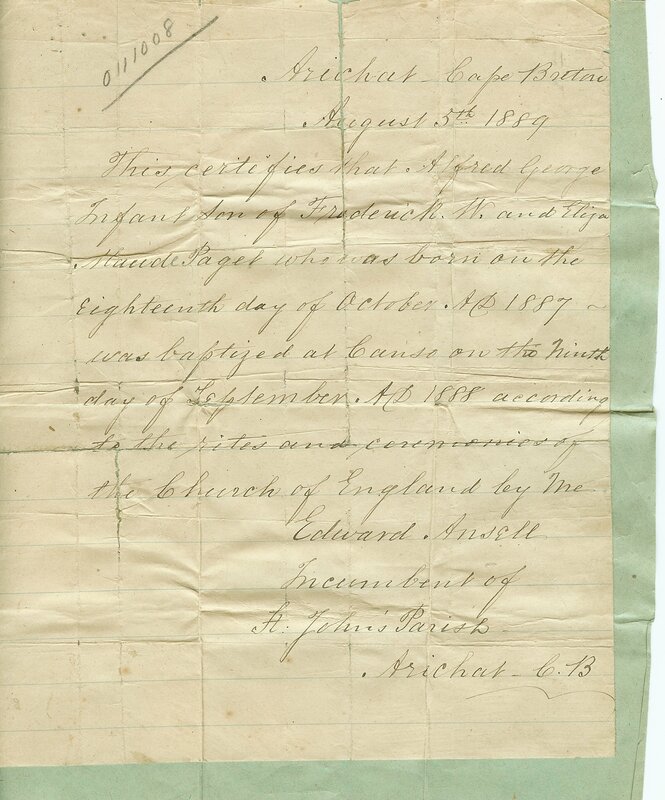 Edward Ansell was born in England in 1829 and died in Arichat, Nova Scotia on 13 Jun 1905. 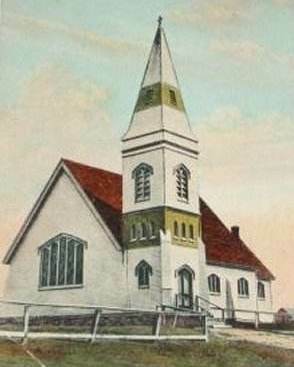 He is buried at St. John’s Anglican church at Arichat, Richmond, NS. i. FREDERICK WILLIAM5 PAGET, born in Hawaii 1923.
ii. ELIZABETH ANN5 PAGET, born in San Francisco, San Francisco, California 1927. 4. ELIZABETH ANN5 PAGET (Alfred4, Frederick³, John George², John George¹) Elizabeth married in Redwood City 1950, CHAUNCEY GEORGE RUST. i. Bruce David6 RUST, born in Redwood City, San Mateo County, California 29 Oct 1951. Died in Colorado on 14 Aug 2012. RIP Dear Bruce! Chronology of the Commercial Cable Company in Canso and Hazel Hill, Nova Scotia, Canada.